As visitors pull into the entrance of Hobcaw Barony, they’re greeted by the Discovery Center. Researchers, students, and curious guests can explore this small museum before scheduling a tour of the historic property. Many of the exhibits in the Discovery Center feature artifacts from the property’s history, including audio interviews with former residents, two original Caines Brothers wooden duck decoys, Belle Baruch’s riding apparel and a handful of her trophies, and many other objects. The Between the Waters team was curious about the work that goes into preserving Hobcaw Barony’s collection, and was able to get a look at what goes on behind the scenes. 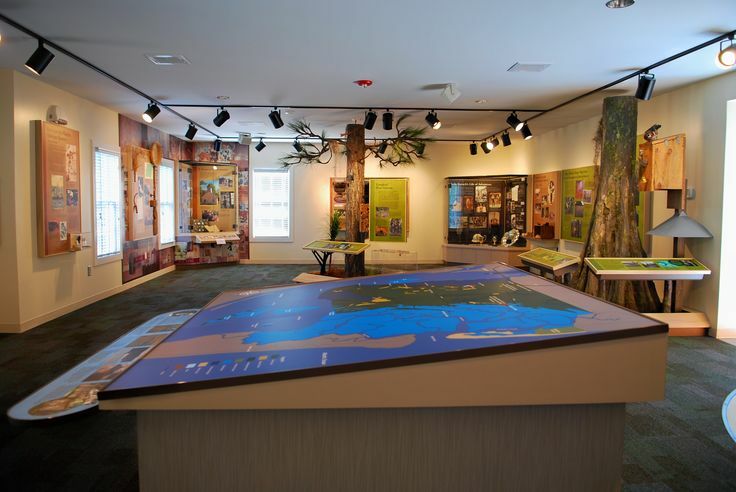 Exhibits featured at Hobcaw Barony’s Discovery Center. Besides those on view by the public, many more materials belonging to the Belle W. Baruch Foundation are housed in a climate controlled wing within the Discovery Center, protected against the damaging effects of humidity, dust and mildew. A number of other artifacts, textiles, books, and artworks are located at Hobcaw House. Since the collection is so large and widespread, meticulous records must be kept to prevent any of the objects from being misplaced, lost or stolen, and to ensure that they can be easily located. 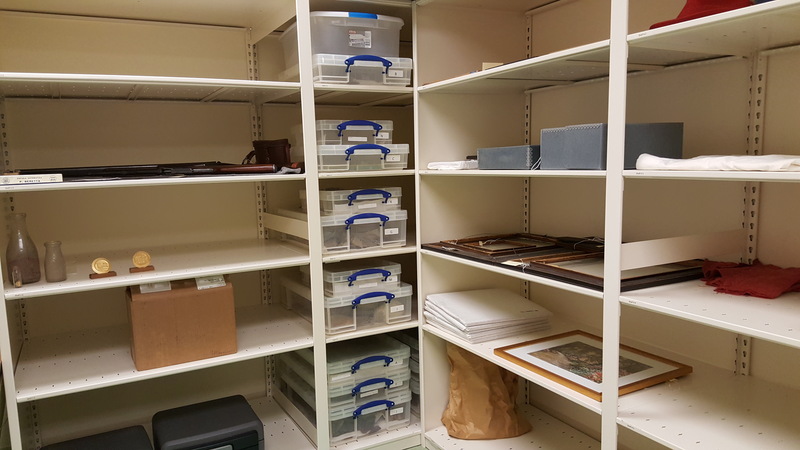 Hobcaw’s archivist, Richard Camlin, has worked diligently alongside staff and volunteers to inventory each object, and to photograph and enter them all into a searchable records database. The Belle W. Baruch Collection available for browsing on Georgetown County Digital Library’s website. Click the image to visit the collection. Though this database is only accessible to staff, a collection of 850 photographs is available online through the Georgetown County Digital Library. The Belle W. Baruch Collection was the first to be digitized by the GCDL. Since then, more than 1,000 additional photos from the Baruch collection have been catalogued and entered into the Foundation’s database, each with its own unique accession ID. Now staff are researching the photographs and entering individual descriptions. Once this task is completed, these photographs may also be made available online. In the meantime, scanned copies can be obtained by contacting Hobcaw’s archivist. A portion of the collection storage area showing paintings, Native American artifacts, and some of Belle and Bernard Baruch’s former possessions. Photographs make up a small portion of the collection housed in the Discovery Center, which holds artifacts from every era of human history at Hobcaw Barony. There are Native American pottery sherds, projectile points and tools, some as early as 1,000 BC. Equipment from the Donaldson Brothers rice mill is stored at the Discovery Center, as well as bottles, cooking utensils and other relics of daily life from Friendfield Village. There is also a large collection of material from the Baruch family, including Belle’s clothing and guns, personalized playing cards, books, paintings, letters between Belle and her father, cartoons and blueprints. Some of Belle’s personal effects, including two of her shot guns, a pair of binoculars and trophy from an equestrian competition. To ensure the preservation of these items, care must be taken to prevent deterioration from age and exposure to the elements. Paper materials and photographs are stored in acid-free envelopes and kept in filing cabinets. Certain textiles, such as clothing, are left unfolded, stored on flat surfaces and protected from dust. Older books are stored upright on bookshelves in a cool, dry environment. One constant in the care of these materials is to avoid exposure to light. Too much light can do serious damage to sensitive historic materials, increasing fading and discoloration of paper, photographs, books, textiles, and documents. The Baruchs had a large collection of art, including a valuable set of Aston Knight paintings. To ensure that proper care was being given their art collection, the Belle W. Baruch Foundation recently consulted the Gibbes Museum of Art in Charleston, South Carolina. 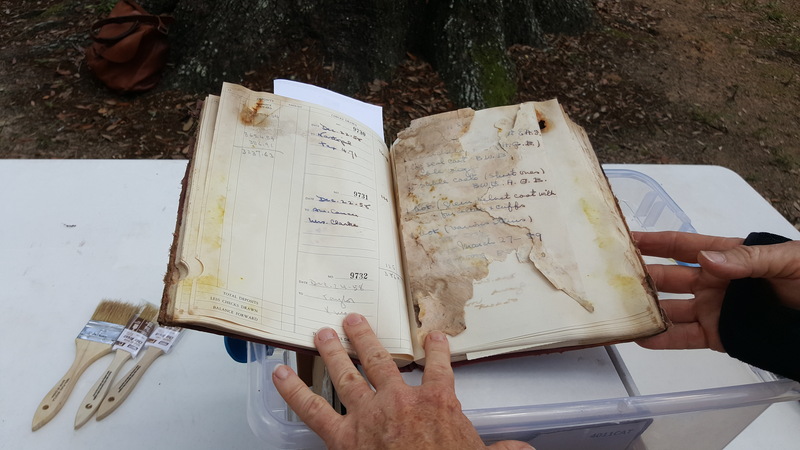 Staff from the Gibbes assessed Hobcaw’s collection to evaluate whether any restoration was needed, and to determine the best methods of preservation. The Baruch Foundation has framed all of the Aston Knight paintings to archival standards, using acid free mats, acid free foamcore backing and UV protective glass. This method of framing protects paintings from light damage, and from developing the rust-colored spots known as foxing. 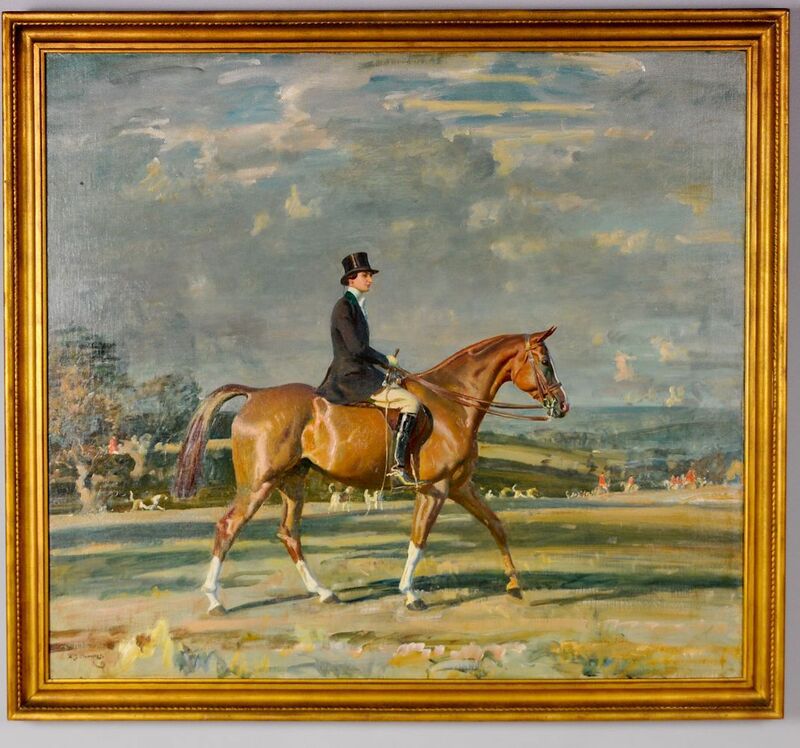 One of the paintings from the Baruch Collection, “Belle on Souriant” painted by Alfred Munnings. As research continues across the property – including ongoing work by students at Francis Marion University in the basement of Belle Baruch’s Bellefield home – questions regarding storage, preservation and restoration arise. The Francis Marion study has led to the discovery of a collection of Belle’s riding attire, checkbooks, and hundreds of copies of checks and receipts. Belle’s partner, Ella Severin, passed away in 2000 and Bellefield has been uninhabited since it was vacated after her passing in 2003. The Foundation lacked the means to preserve the objects within Bellefield until a grant was secured through the partnership with Francis Marion University. Belle’s clothing, including her riding attire, has been stored in the basement since her death in 1964. The garments are in poor condition and will require expert cleaning and restoration. Essential to prevent any further deterioration, treatments for textiles and fabrics include hand vacuum cleaning with a low suction HEPA filtered cleaner, wet cleaning, and hand dry cleaning. Restoration entails the replacement of missing material by a specialist using the original techniques of manufacture. One of the checkbooks discovered in the basement of Bellefield by Francis Marion students, in poor condition. Most of the checks and receipts discovered in the Bellefield basement are covered in mold and mildew. Though these documents are currently being catalogued and entered into the system, permanent storage presents a problem, as their condition could compromise other archival materials and artifacts. Should these items be stored in a separate area, and if so, where? Climate controlled storage space is at a premium at Hobcaw Barony. Since these documents are already in poor shape, would it be best to digitize them and preserve the information and dispose of the physical copy? This brings up the question of which is more valuable, the information on the document or the historical significance of the artifact itself – a dilemma many museums and archives face. These historic objects and archival materials are worth preserving because of the valuable information they hold for students and researchers. While they are not available for study now, there is a possibility that they will be in the future. 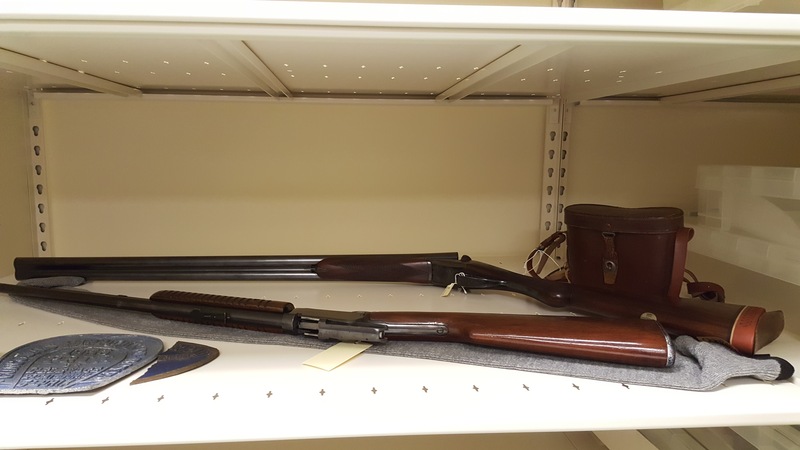 The Belle W. Baruch Foundation recently expanded it’s mission to include preserve and research the property’s cultural resources, and it is the hope of the Foundation that future funding and research will hasten the availability of its collection to students and researchers.